Shipping sensitive products across vast distances requires special temperature control equipment. Most often, keeping these products cold is the primary concern. However, for some items, heating is equally important. 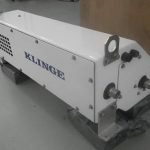 For these applications, Klinge Corporation offers dedicated tank container heating units. Our products help you maintain precisely controlled temperatures by pumping a heat transfer fluid around your tank container’s existing steam coils or wrap around plates. Designed for demanding applications, our tank container heating units are reliable and easy to operate. Use them in food and beverage shipping, pharmaceutical transport, and more. Model TCH-006: The Klinge Corporation model TCH-006 is a 6 kW tank container electrical heating system. It features a smaller control box that saves space when end-mounted on a tank. We designed this system so that control components remain accessible at all times, regardless of how the unit is installed. As a result, it is easy to make adjustments and maintain a stable temperature. Model TCH-112: The TCH-112 is the larger version of the TCH-006, which features the same innovative control box and dependable performance, while providing a full 12 kW of heating power. Use it to maintain stable temperatures and keep products safe, even in extreme weather conditions. We’ve listed some of the most common applications for both units below. A Klinge Corporation representative would be happy to help you assess your requirements and determine the best tank container heating system for your needs. Call or email our office to speak with a representative today. Heating is essential to protecting certain goods during shipment. When winter months roll in, long-term exposure to extreme cold conditions can affect items in several different ways. Manufacturers and suppliers heat cargo for the same reasons they recommend that end-users store and operate their products within a given temperature range. Food and pharmaceuticals can spoil, chemical products can freeze, and plastics can become brittle, potentially affecting their structural integrity. Ultimately, the specifics of your application as well as the location and condition of the shipment will determine whether or not heating is required. Pharmaceutical: Delicate pharmaceutical products must be transported within a precise temperature range to prevent spoilage. Many shippers use tank container heating units to prevent temperatures from exceeding lower limits and avoid freezing, which can affect a drug’s potency. Food and beverage: Not all food should be kept frozen during shipping. Some luxury items, such as wine and chocolate, will spoil if exposed to low temperatures. A tank container heating unit is critical if transporting these products during the winter months. Chemical processing: Demanding industries such as automotive and heavy machinery manufacturing rely on temperature-sensitive chemicals such as methylene diphenyl diisocyanate (MDI). Tank heating units help maintain a reliable, productive supply chain in these and other applications. Often, manufacturers and suppliers dealing with temperature-sensitive goods will avoid shipping during extreme cold periods. This results in production delays, potential shortages, and other issues that affect their bottom line. Investing in a Klinge Corporation tank container heating unit can help you maintain productivity year-round. For more information about the benefits of our products or to request a quote, call or email our head office today.